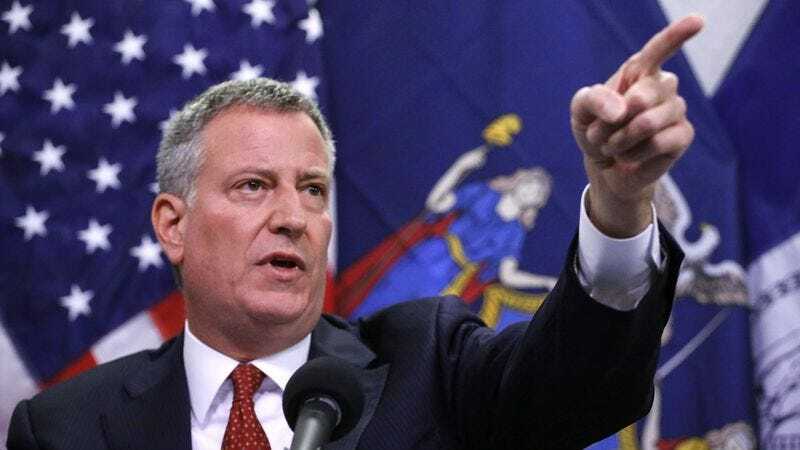 NEW YORK—As a major winter storm continued its advance toward New York City, Mayor Bill de Blasio advised residents Monday to make peace with whatever higher power they call God, for all shall meet their death in the coming tempest. “The furious hoarfrost bearing down upon us knows neither mercy nor reason, and all within the five boroughs will perish, cowering in their brittle dwellings,” said de Blasio, adding that none would find succor from the gale save those favored by providence to pass quietly in their sleep. “This shall be a tempest the likes of which has never been glimpsed by man or beast. Clutch your babes close to your breast and take small comfort in knowing that they will howl for but a few hours before death becalms them forever.” De Blasio added that, barring an unexpected intensification in the storm, normal subway and bus service would resume Wednesday.